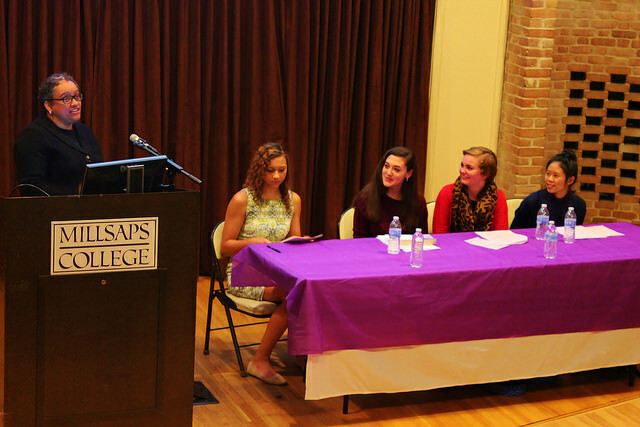 During last week’s Friday forum, four members of the class of 2018 presented essays on this year’s Core 1 summer reading book, Half the Sky: Turning Oppression into Opportunity for Women Worldwide, by Nicholas Kristof and Sheryl WuDunn. Half the Sky centers on the oppression and mistreatment of women in developing countries, particularly forced and semi-forced prostitution, sexual violence, and high maternal mortality rates. Dr. Shelli Poe moderated the event, beginning by giving her thoughts on the book, the situations it addresses and the ways we as Americans perceive them. The first-year students were asked to respond to questions on the root causes of the situations the book discusses and how to improve them as well as how the authors define empowerment. The papers ranged in their treatment of the topics. Decoteau suggested a multi-step program to rehabilitate and empower woman rescued from abusive brothels. In contrast, Lee identified the need for cultures to change themselves, as opposed to relying solely on Western based aid. Hussey elaborated on the themes of empowerment as defined by Kristof and WuDunn. Sit used the high maternal mortality rates in the societies Kristof and WuDunn included in their work to explore how cultural forces influence them. All four presentations shared themes of education, empowerment and changing cultural ideas in developing nations. Half the Sky has become a multi-media movement and foundation that works to create solutions to the problems presented in the book. In the past five years the organization has raised over $5 million to continue bettering the lives of women and girls around the world.